Is there a graduating scale of how alive someone is? Can we say the injured adult on life support for massive trauma is less human? They are not viable outside of the hospital bed, or self-sufficient. Under normal means, many people at any given time can be incapable of independent living. In the future they will hypothetically be capable of living on their own again. For this reason they are artificially supported. It could be a major trauma with a positive post-surgery prognosis or a debilitating disease undergoing treatment. The individual is factually incapable of living without support in the immediate; it is understood however they will at some definite point be able to function normally. It is a matter of time, not their present state, that determines the viability of a human. There is a problem here. For a child, it is simply a matter of time, as with an adult, before they are independently able to develop. It can be tracked with relative exactness, more so than an injured adult waiting to achieve viability yet again. Is the worth of an adult life measured in the immediate? Is the use of medication or ventilators presently determining a lack of viability, thus a non-human status? We await the day a person heals and returns to normal. We await the day when a child takes its first steps. Eats with a spoon for the first time. Walks to school alone; was the child less human before each measure of independence from Mother? This larger problem of independence looms. What stage of development is considered independent existence from their parents? Can anyone with a child actually claim they develop independently? A preterm baby, in a ventilator and receiving treatment as the trauma patient does, develops further. They follow the same route every baby does no matter their supported location or placement in time. A child still in the womb, at the same level of development, is just as capable of surviving the external treatment other children their age undergo. Is a baby post due date more, or less, viable? Are the considered “alive” but in the wrong location? They were considered “alive” and “viable” if they had been born on the due date. Is a preterm baby alive but non-viable? They are outside the womb, but not independent of support. Is a trauma patient alive but non-viable because of the same support? Does the location alone form the determining factor? Are children born in the “wrong” nation less human or less viable, because of locale? There are milk banks, for women to donate breastmilk, for premature infants, some in the 20th week. Preterm babies do better when fed breastmilk. (Their own mothers won’t lactate for many weeks, given the circumstances). Studies show premature babies – even extremely fragile early ones – grow healthier and better when put skin to skin with parents or volunteers, and carried upright as part of routine treatment. These simple developmental facts of nurturing demonstrate their humanity. The children are not independent of support, even if considered alive and viable. A newborn is certainly considered viable. If one, however, chooses to ignore their viable (and according to the definition, “further development can occur independently of the mother”) newborn and have them develop independently, they will find the opposite result of the definition of viable. The newborn will quickly die of a few factors. Failure to thrive and starvation being two immediate ones. A mother who does not rear her offspring kills it with neglect. How is this possibly independent growth? If anything, a born baby is less viable than a baby in the womb. A gestating baby has everything provided and done for it, the mother does nothing but exist. A born baby needs constant care and feeding. We also continually push back the age at which a baby will survive early labour. Even 18-week babies surviving, while rare, is not unheard of. In the Victorian Era, there was a wasting disease of babies, called “failure to thrive”. The babies could be taken care of materially, but they would still die off. Orphanages had a 100% mortality rate at times. Anecdotal discoveries made some doctors instruct their nurses to hold each baby for a short session each day. The failure to thrive deaths drastically reduced. Children need human contact to be healthy and even to survive. The direct translation of “fetus” (Latin) to English, is “offspring”. When is the fetus capable of growth and development independent of the mother? A baby’s world is the mother, whether in or out of the womb. A newborn needs physical contact to be healthy, has to be fed and needs to be cleaned when soiled, as well as protected from harsh climates (it is winter here in Ontario, necessitating shelter and warmth) and predators. An infant is no more capable of survival than a newborn, and a toddler may eventually be potty trained and go through the fridge, but cleanliness and nutrition are far out of reach. A child cannot outrun predators or fight back, but cannot care for and sustain itself alone. While most teenagers may actually get through singular survival out of sheer rebellion and foolhardiness, college and university students seem to be in regression. They apparently cannot emotionally handle mean words, they throw fits, smash things and scream when they don’t get what they want/their own way, and can’t cook Kraft dinner: making them about as capable as the toddlers. So what is viability? What is humanity? If we found DNA floating in the atmosphere of Jupiter, it would be alien life, from Jupiter. When we find human DNA in a woman’s womb, we question what it is. That DNA is the same at conception that it is when born, that it is when an adult, and still the same hundreds of years after death extracted from the pulp of a tooth. That “mass of cells” is always going to be born from a woman, either naturally through the birth canal or via c-section. That “mass of cells” will always be a baby at birth. It is not a guessing game or mystery box. We never ask a woman “is it human”, but “boy or girl”, with the presupposition that she has a baby inside her. A “mass of cells” at 7 weeks looks like a little peanut, with a visible head and body, and more importantly, with an evident beating heart, pulsing like a strobe light. That is not a mass of cells, that is a definable human being, with a brain. At 19 weeks, when the average ultrasound takes place, a woman can see her baby’s skeleton, the features of the skull, its actual brain and inspect the lobes herself; one can see the baby kicking, sucking its thumb and watch its heart beat and the different sections of the heart work. Anywhere else in the world but inside a human mother we would say that baby is a human. The very place that baby is intended to be somehow negates its humanity and makes it a “mass of cells”. No child is viable, by the definition of viability, for no child can live without their mother or a comparable surrogate. A newborn and infant surly cannot develop independent of their parents; warmth, safety, sustenance and even the need for touch are dependent absolutely on the mother (and includes the father). In what way is this dependence “independent development occurring”? The baby’s brain is still growing, the skull has a soft spot and the plates have to shift into place and eventually knit, it has no practical immune system, the liver doesn’t function for weeks and the digestive tract is incapable of processing normal food if the toothless gums could even manage anything; these are growth and development. There is huge visual and verbal development in the first weeks (compare the cries days after birth to the babbling and laughter-squeals at two months, or how long before the baby follows sounds with its eyes) post birth. Language and walking don’t come for nearly a year. Those are developments and growth, and language is dependent on the mother/father or family-clan-social group. If we can kill children for a lack of viability, we have two solutions: there’s no killing of humans (especially for the decisions other individuals make), OR we can kill people for convenience or monetary reasons, up until they are able to work and provide for themselves. All a fetus needs is a place to live safely and a source of nutrition and contact with another human. Isn’t that the definition of survival and viability for all humans? 8 weeks, 5 days; not a mass of cells but visually human. There is an interview from a Patricia Hajdu, Canada’s “Status of Women Minister” (I didn’t know that was a thing either, but I am so pleased the food from my child’s mouth is taken from me in the form of taxes to pay for such needed roles in government). It took a bit of searching, but there are a few sources. It could all be the exact same article spread over Canadian news sites. The government wants to hear diverse, and opposing views and opinions. That’s right. The government will only accept opposing views that agree with their opinions. Let this sink in. The only opposition our government will listen to is the opposition that agrees with how they feel, what they think and their personal paradigms. We have the right to their opinion, and we can dissent, so long as we get permission and only disagree with things they disagree with. “The work still has to happen within values and evidence and the Charter of Rights and Freedoms, so what we want at Status of Women is to empower women and to ensure the protection of women’s right to choose,” she said. I have my grandfathers old criminal code books and the Canadian Charter from when I took law; he was a retired police officer and had them on his shelf. My brother has the Charter as a poster and new criminal law books, from when he did police schooling. In all this, I have never seen “abortion” or “feminism” anywhere in the Charter. There is no clause that states “protection for a woman’s right to choose”. Nor is “empower women” there. R v. Morgentaler decriminalized abortion in the legal system twenty years after the Charter was written. The Supreme Court also unanimously found the state has an invested interest in protecting the fetus/unborn child. There were two items not decided on in their ruling: whether women have a Charter right to abortion, and whether fetuses/unborn children are included in “everyone” in section 7 and entitled to the same rights. Abortion is a legalistic limbo in Canadian law, not something that is actually protected; it is not even mentioned or defended. Law directly contradicts Hajdu. Shouldn’t someone who lives a cushy nice life on my tax dollar, who claims to be speaking for all women, in an official capacity in the government, know the simple basics of Canadian Law? No, your claims are not enshrined in the Charter. Fact: the Supreme Court of Canada disagrees with you, Patricia! The Supreme Court specifically said no to a Charter defence of abortion, contrary to your claim. Also, the law does not actually cater to feminism. Then I have to ask, what about all the women the “Status of Women Minister” disagrees with? Are they protected as women and allowed to have their own opinions? Or do they only have representation if they fall in line, do what they are told, obey, and disagree on things with which they’re allowed to disagree? We need diverse opinions, so long as the government consents to the opinions. Is the Status of Women Minister working for all Canadian women, or just the ones she likes? A lot of Canadian women are against abortion. The number of pro baby young girls is growing. None of these voices are accepted by the Canadian government. A woman’s voice is of worth if she toes the line and does what the government says and follows the government policies already laid out. Canadian government feminism defends women saying things they like; they will not represent, aid, protect, or even listen to any women who have their own opinions. What about women who work hard jobs and don’t want to be made to work while raising a family? The glamour jobs of career women exists for almost no actual women. Yet every woman is being ideologically shoehorned into the model of high paying, upper level glass ceiling jobs, which are reality for nearly no one. Every woman is treated as though she is privileged for being able to work and raise a family at the same time. What if a woman want to raise her kids, but can’t – or simply does not want to – do a hard labour or factory job? Because the government bases its policies on feminism, and women fitting in their pre-established archetypes and delusions of utopia, these women will not be heard. 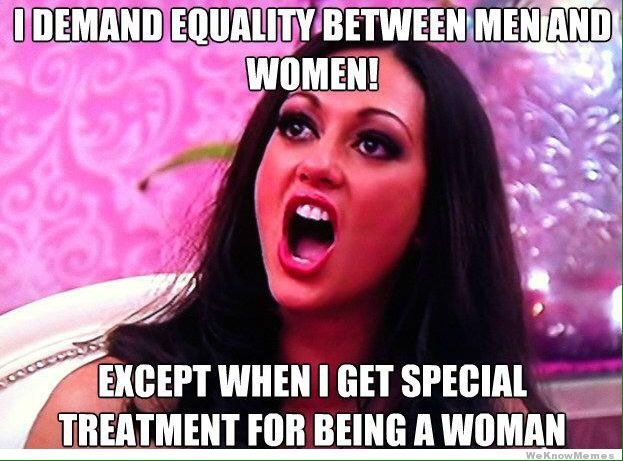 Is this pro feminist picture for or against women? If one does not fit into a certain protected group, feminists feel free to personally attack other women. My dresses are mostly recycled saris, nearly everything I have is second hand, my head is not empty but my wall sized bookshelf is full, sometimes three books deep, and we are a working class couple with our first baby coming soon. There is, however, no reason to be frumpy and one can be clean and pleasant, even attractive, while poor. Is the first woman, even if she worked really hard and lives in a tiny apartment, so she could save and afford that Chanel and Prada, to be excluded by the Canadian government for not fitting their stereotypes? 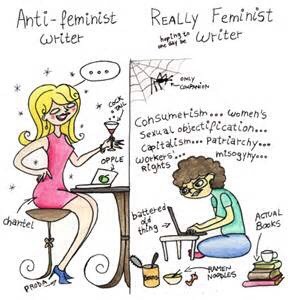 Is the second woman actually doing something of value, is she even a good writer, or does she lack the skill and is resentful and bitter, blaming men for her own failings? Will she get government grants and job placements because she fits what the government deems a good feminist woman, worthy of their time and Canadian taxes? Well behaved men rarely make history. There have been how many billions of people on the earth? How many serfs do we know, merchants and traders, knights and militia, monks and priests? We know of very few people who have lived. How delinquent and selfish do women have to be, that a lack of infamy is a mark of oppression? Why does anyone need to make history? These feminists should go to a graveyard and see all the names of forgotten people, male and female, who also never made history. Their own families don’t even know they are there. The entire idea is a non sequitur. The other issue is that there are plenty of women who have made history. Also, without women, many of the men in history would never have made it. Not everyone has a starring role. Every play has support actors, without whom there is no play. Is the role of a wife and mother, sisters and cousins, aunts and in-law, who directly contribute to a man’s success, to be so tossed aside by feminism? If they aren’t the star of the show, their role doesn’t matter? That is true oppression. Expecting every woman to be reckless and overbearing and a star. Most people never achieve this. What about the women who are famous? There are women who did make history. We have Hatshepsut, a queen who stole her step son’s throne and became a pharaoh. Nefertiti, a legendary beauty and integral to the Amun cult of Akhenaten. Nefertari was Ramesses II’s favourite wife and well known enough that we still know her name. Ankhsenamun was the wife of King Tut, his half sister, and mother to two very human looking embalmed unborn (miscarried) children. These are just women off the top of my head from 5000 years ago. In the bible we have Sarah and Hagar (there’s the feminists precious infamy), Judith who beheaded a king, Naomi who kept her gentile daughter-in-law in her family and faith, even after her own son’s death. Without the goyim Ruth, there would be no kings David and Solomon, and thus no Christ. What about Magdelene, sisters Mary and Martha, Elizabeth the mother of John the Baptist; or that the first to see the risen Christ were women and not men. For the atheists: taken as just a story, contemplate the importance of the first people to see God alive after execution, and that they were women. Have these women not also been enshrined in history? We have an abundance of famous, great Saints who are women. St Clothilde, wife of Clovis, who in converting him changed the course of history for Europe. St Joan d’Arc, ending the Hundred Years’ War. St Teresa of Avila, one of the greatest spiritual writers, and St Hildegard Von Bingen, regarded as a genius. St Helen, mother of Constantine, who found Calvary. St Bernadette, a simple peasant girl from France, loved to this day. St Catharine of Sienna, who told off a Pope, righteously. There are dozens more. Mary Queen of Scots, Mary Tudor, Queens Elizabeth I and II. Queen Isabel of Spain, who drove out the moorish invasion of hundreds of years. Catherine the Great. Hanna Reitsch who was a female Luftwaffe pilot. Are these not women of history? Then of course, the most beloved, venerated, adored human to have ever existed, Holy Mary, mother of God. In what way have any of these women not made history? They were all either well behaved or fulfilling their duties, which is in fact being well behaved. Even if we have salacious and mostly fictional or out of context stories today, the same happened to famous men. Most were good and duty driven, we only think differently because of legend and fabrications.